Not surprisingly, Monaco sells some of the most expensive Grandstand seats on the current F1 calendar. The tight confines of the principality don’t lend themselves well to large seating areas, meaning less than 40 000 grandstand seats are sold in Monaco. After remaining virtually unchanged for a few years, prices increased by up to 20% in the last few years. Buying tickets at Monaco is a little different to other races, where you normally buy a 3-day ticket and sit in the same seat for the whole weekend. At Monaco, the majority of tickets on sale are for one or two days. As a result, many fans choose to mix it up and sit in different grandstands each day. Tickets are cheapest for the first two F1 practice sessions on Thursday (all priced between €70-90). Entry on Friday is free and whilst there is no F1 action, support categories are on track in the morning before the circuit is opened to fans in the afternoon. Weekend tickets start from around €500 for the cheaper grandstands, or just under €200 for the Rocher general admission zone on the hill leading up to the castle. Support the ongoing development of this site by buying your F1 tickets from our partners, Gootickets. We receive a small commission when you buy using the links on this page. We don’t apply any markup, so you’ll always pay the cheapest price! We also recommend Official Ticket Packages from F1 Experiences. 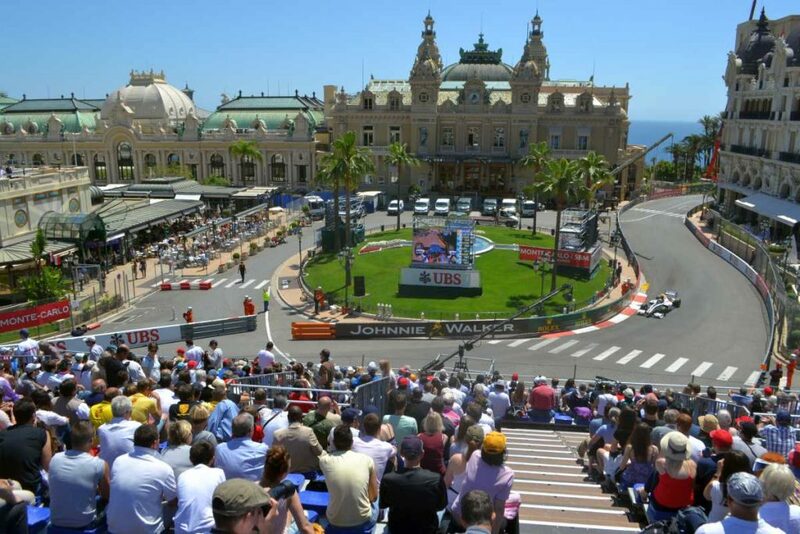 We have a very limited number of tickets to sell in the Z1 General Admission area at Tabac for the 2019 Monaco Grand Prix. These are race day tickets for Sunday, May 26. The Z1 area is a small standing area next to the Tabac corner at the entrance to the Swimming Pool complex – more information below. Only 400 tickets are available every year and they sell out within days of going on sale. Minimum order 2 tickets. Price per ticket €280. Discounts available if purchasing more than 2 tickets. Contact us for more information. Children aged between 6-15 get free entry on Thursday and a 50% discount on weekend tickets. With the exception of a small part of Grandstand T, none of the Grandstands at Monaco are covered. Remember to check the weather forecast and pack accordingly. Grandstand seating at Monaco is either benches or individual seats without backs; bring along a cushion to make your day more comfortable. The following ticket categories tend to sell out most quickly at Monaco: Z1 Sunday, K Lower, O Lower and Virage. 2019 Monaco Grand Prix grandstands map. Click to open large version in a new window. Best Monaco tickets to buy? 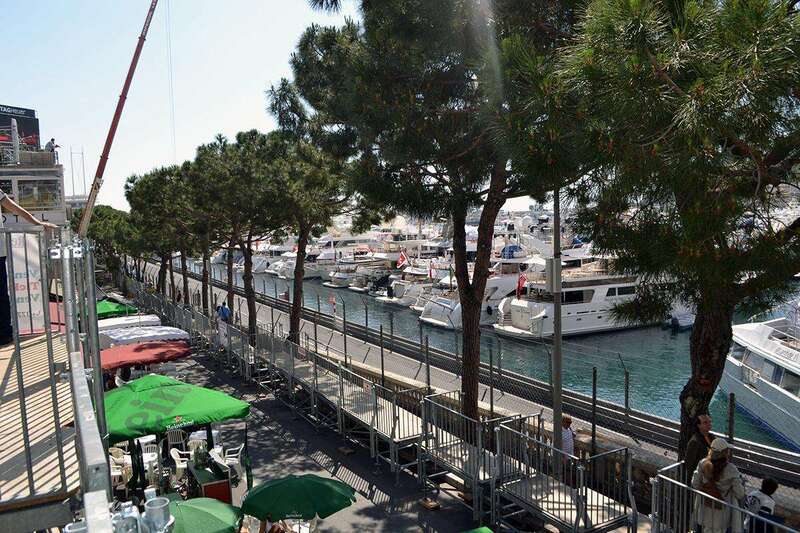 The largest and best grandstands at Monaco (and the best atmosphere) can be found in the harbor complex from the Tabac corner through to La Rascasse. The K grandstands are a safe bet, as are O and T, both of which have views of the pits. In our opinion, grandstand B on Casino Square is overpriced and doesn’t offer good views – but it’s an iconic location and worth checking out on Thursday or Friday. Monaco has two general admission zones for F1 fans on a budget. Rocher is a hill which overlooks the last two corners of the lap and Z1 is located near the entrance to the Harbor section of the track between the Nouvelle Chicane and Tabac. Having checked out both areas, we would choose Z1 due to its harbor location, where you feel like you are much more a part of the atmosphere at the circuit, as opposed to looking on from afar at Rocher. Prices in brackets = (SOLD OUT) for 2019. F1 Experiences offers a range of exciting ticket packages to the 2019 Monaco Grand Prix. Fan Experiences Ticket Packages include select grandstands plus exciting benefits such as opportunities to meet F1 drivers and Insider Access to the F1 Paddock, while Champions Club Ticket Packages offer hospitality access to La Maree Restaurant, the Ermanno Penthouse and a Trackside Yacht. Secure your Monaco tickets package now! Grandstand A1 is located on the inside of turn 1, otherwise known as Sainte Devote. Following the start/finish straight, the track narrows considerably at Sainte Devote; you can almost guarantee some action here on the opening lap of the race. From the top row, you can also turn around and glimpse the cars entering the harbor section of the circuit, right behind the stand. No access to a big TV screen. YouTube view of Grandstand A1. Grandstand B at Casino square is one of the most expensive on sale at Monaco. 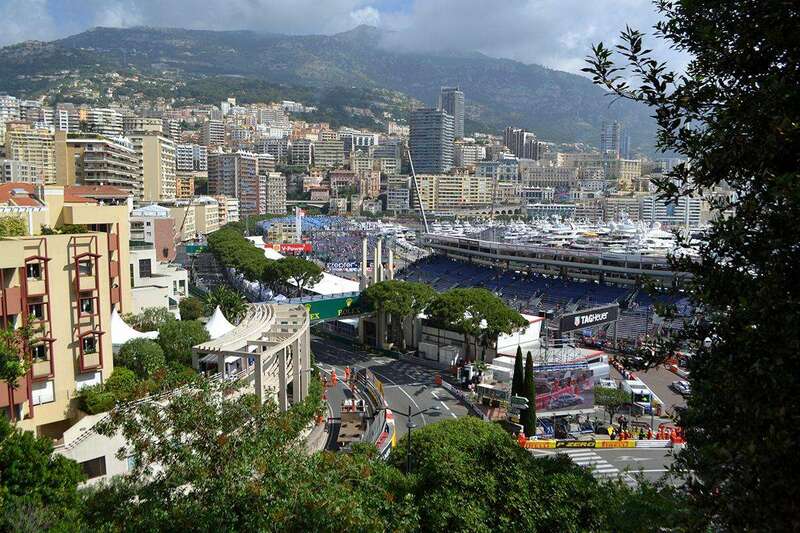 Located opposite the Casino and close to Hotel de Paris, you get a view of the cars taking the tricky Casino corner before heading down the hill to Mirabeau. This grandstand offers big screen TV viewing. Given the high price and lack of panoramic views of the circuit, there are better options for a 3-day pass to Monaco – but Grandstand B is worth considering for one day. Grandstand C is located on the Portier Corner before the tunnel entrance, an important section of the circuit where drivers try to line up overtaking moves. Tribune C is a good value option on both Thursday and Saturday but lacks the atmosphere found in the Harbor section, which offers better race-day Grandstand choices. No access to a big TV screen. Grandstand K is a large and popular harbor grandstand with good views from the exit of the Nouvelle Chicane, the Tabac corner and up to the entry of the Swimming Pool complex. Seats in the highest row of K also offer views behind of the main start/finish straight and turn 1 (Sainte Devote). The best seats are in the first two zones, closest to Tabac. Grandstand L is located next to the Rainier III swimming pool with views of the last turn in the Swimming Pool complex as well as the pits. Not the cheapest Grandstand at Monaco, but a safe choice for a first-time visitor who wants to be at the heart of the trackside action. Grandstand N (Piscine Panne Nord) and Grandstand P (Piscine Panne Sud) are wide and low, flank the higher and more expensive O grandstand in the centre. All three grandstands are located over the water in the harbor with views of the swimming pool complex of the circuit. Grandstand O (Piscine Plongeur) is the highest of the three grandstands in the harbor facing the swimming pool section of the circuit. If you can afford it, O is a better choice than N or P, as the views are more panoramic and you also get a distant view of the pits – bring binoculars! All three grandstands have views of a big screen TV. Grandstand T, located in the Harbor area opposite the pits, is one of the larger grandstands at Monaco. The grandstand is divided into lower and upper areas – the more expensive higher seats have views of the pits. On the track, you will see the cars taking the last turn of the Swimming pool complex before heading down the short straight to La Rascasse. Grandstand V is a small stand located very close to the circuit on the outside of the Anthony Noghes corner, after La Rascasse and before the main start-finish straight. This grandstand also provides a view of the cars entering pit lane. This stand is good choice for at least one day but there are better 3-day grandstand choices. Grandstand X1 and X2 are small, low grandstands on the main start-finish straight. Apart from offering a good view of the race preparations and start, these stands are not the best choice and their cheaper price reflects this. If you do decide to buy here, X2 is the better bet as it is closer to the start/finish line. No access to a big TV screen. The largest General Admission zone at Monaco is only open on Saturday and Sunday. A steep hill with little in the way of creature comforts and set back some distance from the track, it is difficult to get a good spot to view the action from here. You will improve your chances by arriving early, but regulars will still have reserved the best spots. The big screen set up for Grandstand V is visible (but distant) from Rocher, so bring along some binoculars. Click here to see a video of the view from Rocher. Z1 (Enceinte) offers unreserved standing only areas on the straight between the chicane at Nouvelle and Tabac. It’s also very close to the opening Saint Devote corner. There isn’t much room and the views are somewhat restricted, but it’s still a good place to hang out and take in the Monaco atmosphere, and it’s much cheaper than the grandstands. As a bonus, there are also several bars and restaurants in the zone with lots of outdoor seating. Limited big screen TV viewing. Z1 offers the cheapest race day tickets in the heart of the action and race-day tickets sell out almost one year in advance, so get in quick! YouTube view of Z1. Been to the Monaco Grand Prix? Leave a comment with your grandstand tips! I want to buy cheap ticket and can you advice me which place would be good and from where i can buy? Hi Marama, the Automobile Club de Monaco is the promoter and official ticket agency for Monaco F1 tickets, but they may not be the best place to buy. I note they are currently upgrading their ticket platform, for example. We co-operate with Gootickets, based in Monaco and an authorised reseller of tickets. They have the same prices and are trustworthy. Hi Stefano, one day at Monaco is better than not going at all! You can also go on Friday as it’s free entrance. I’d sit in grandstand K on Thursday, then maybe try and watch the Formula 2 race on Friday from Casino. Read about our two-day trip here. Hey, i wanted to confirm even on the thursday, must you pay the general admission fee before getting into the circuit or is it only seating thats free? You mean Friday I assume. No, you don’t need any ticket to enter and sit in the grandstands on this day. Hi is it still sit anywhere with a ticket in practice Saturday? Hi Graham, I’m pretty sure it isn’t like that. 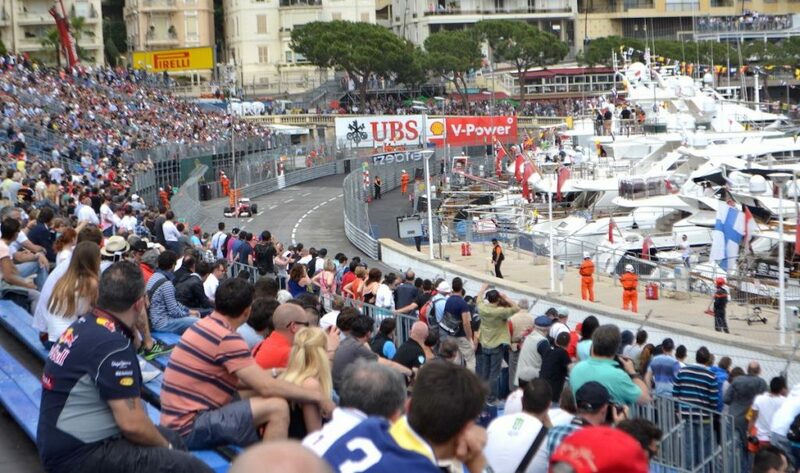 Monaco is getting more popular and more expensive; I think access is fairly tightly controlled to the grandstands. Though you can probably move around once you are in a particular grandstand. The good news is that Friday is still FREE.